you can save a life here at home." HAMPTON, Va., Aug. 6, 2012 – Transitioning service members, military spouses and veterans attending hundreds of job fairs around the country, are finding themselves on the proverbial red carpet as employers pack arenas to add those closest to the armed forces to their payrolls. At such a fair earlier this month in Hampton, VA, Job seekers maintained long lines at the booths of employers in industries long known to hire veterans, such as law enforcement and defense contractors, as well as some less traditional career paths, such as finance. Washington, DC, August 2, 2012 — The new grants will be available to train primary care physician assistants (PAs)and help veterans transition from military to civilian PA careers when they return home. The MedTech Veterans Program (MVP) Boot Camp recognizes the strong correlation behind the mission of the medical technology industry and that of veterans who have transitioned from service in the military to an interest in serving patients and caregivers. The program applies to all military veterans, with special recognition of those wounded overseas. Social Media can be a covert and overt tool as you move from military to civilian life. Join our partner – Lida Citroën, August 23 @ 11am EDT for a free webinar on making the most of Social Media and Networking. To apply online - visit Free Webinar Registration. There is nothing in the civilian workforce that can approximate the bonding that occurs in the wardroom, ready room, or foxhole. Military personnel in those environments put up with much hardship – long hours, stressful working conditions, danger to personal safety, separation from loved ones, and more. However, because they are all in it together, they get through it. This mutual self-sacrifice, teamwork, and covering each other's six contribute to individual bonding, unit cohesion, and, ultimately, the camaraderie in question. Today, Hall said, she is happy to help spouses, transitioning service members, wounded warriors, and their caregivers get – and maintain – CSC jobs. "We have some spouses who have been here for years," she said, noting that the company tries to place them in new jobs throughout their relocations. "We advocate on their behalf," she said. "We're growing, so we're going all over the place" as Capitol One looks to fill 3,600 positions in the next year, Haydon said. 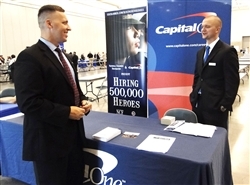 Some of those jobs, such as loan coordinators, require no financial experience – but do require three years in the military, he said. "It's because of their skills, their abilities, ...the duty, honor, and respect," Beggs said of the targeted military hiring. Funded under the Physician Assistant Training in Primary Care Program, the 5-year grants aim to increase the number of physician assistant graduates who become primary care clinicians and teachers. Funding priority was given to grantees that have strong recruitment, retention, and education programs for veteran applicants and students, including academic recognition of medical training and experience gained during military service. Administered by the Health Resources and Services Administration (HRSA) at HHS, the grants are part of the administration's initiative to increase the supply of primary care practitioners in the United States. "If you can save a life on the battlefield in Afghanistan, you can save a life here at home," said Health and Human Services Secretary Kathleen Sebelius. "These grants will help ensure veterans who served our country can use their military medical training and get good jobs serving patients." The grants, awarded to 12 institutions, support educational programs that train PAs to practice in primary care settings, and help individuals who will teach primary care in PA training programs, preparing trainees to enter practice in primary care settings. Georgia Health Sciences University Research Institute Inc.
"The origin of this program came from shared frustration among veterans in finding internships or job placement following military service," said Abiomed Chairman, President and CEO Michael Minogue, a veteran himself, who helped establish the MVP Boot Camp for Returning Heroes after speaking with discouraged wounded veterans. "This program demonstrates the industry's collaboration and commitment to providing the tools necessary for these veterans to pursue successful roles in the medical technology field and continuing to serve a mission to help patients." The MVP Boot Camp will select and invite up to 25 candidates in this first year, who will receive job-search assistance and advice about careers and networking in the medical technology industry. The three-day program, in conjunction with AdvaMed 2012: The MedTech Conference in Boston in October 1-2, kicks off with a welcome reception and dinner, followed by two days of educational programming, networking opportunities and mentorship. "Right now, we have more mentors than we have candidates", said Ashley McMaster, Director of Communications for AdvaMed. "These opportunities aren't limited to officers. We invite and encourage all interested parties to apply". "The medical devices industry already plays an important role in developing innovative products for the military and its veterans. Creating a program that helps train and mentor veterans who may be interested in a career in medical technology is a laudable extension of this industry's efforts," said Jeffrey Shuren, M.D., director of FDA's Center for Devices and Radiological Health. Expenses for veterans to attend the MVP Boot Camp are supported by contributions from military veterans and other donors. To learn more and apply for this opportunity, take a look at the AdvaMed Convention Website.